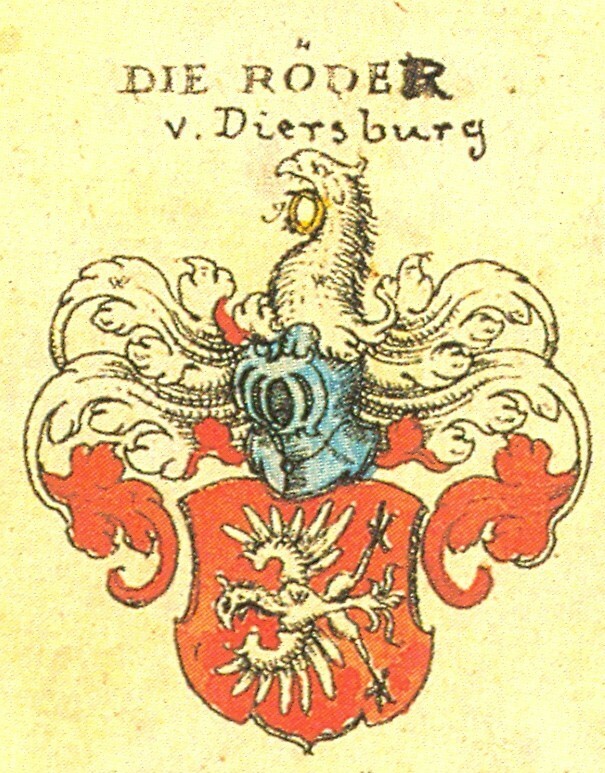 The noble family of Roeder of Diersburg. Also written Röder (see O umlaut). 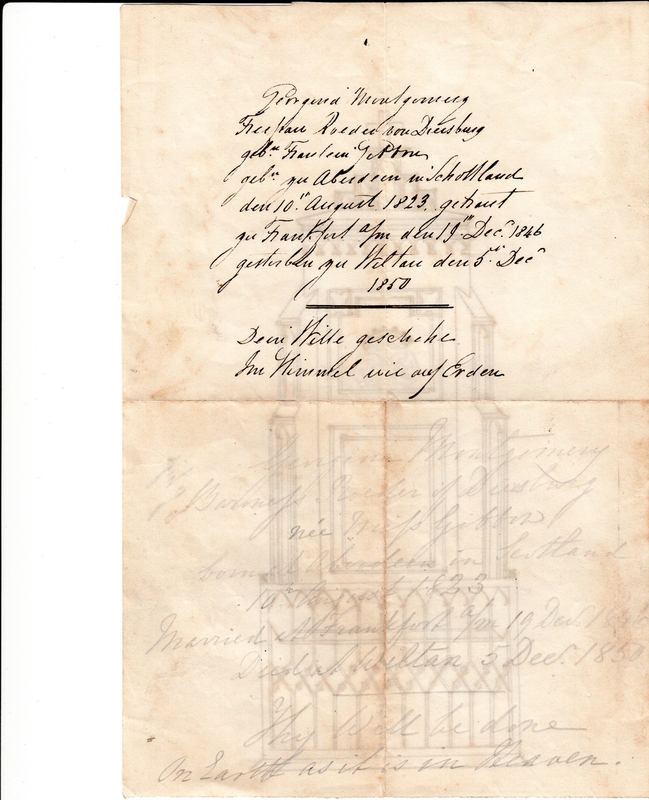 Marriage notice of Georgina says "Roeder". Expenses book of Arthur Augustus Gibbon says "de Roeder" and "von Roeder"
Transcript of Georgina's grave says "Röeder". Would need to see grave. Miniature (perhaps c.1845) of Georgina Gibbon (Baroness de Roeder). of the old noble family of Roeder of Diersburg. At marriage he is listed as of Diersburg, an officer in Austrian service. 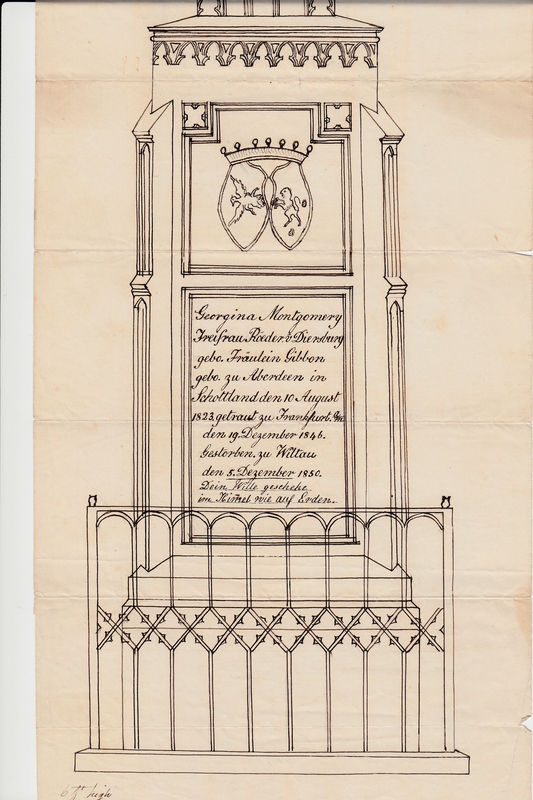 He mar 19 Dec 1846, at the British Embassy, Frankfurt, to Georgina Gibbon [born 10 Aug 1823, descendant of Edward III]. 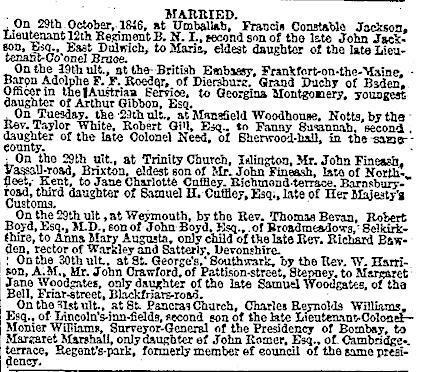 See marriage notice in The Times, 1 Jan 1847. A letter survives from Adolf to his mother-in-law Elizabeth Gibbon, written from Innsbruck, 10 Apr 1849, detailing the bravery of William Henry Gibbon in battle in Mar 1849. 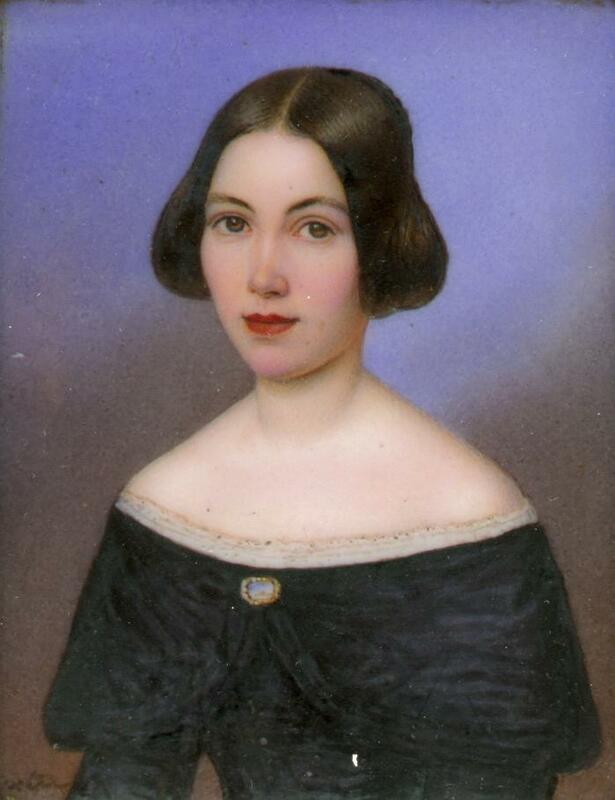 Georgina died 5 Dec 1850 at "Wiltau" [according to grave], Innsbruck, Austria, age 27 yrs. 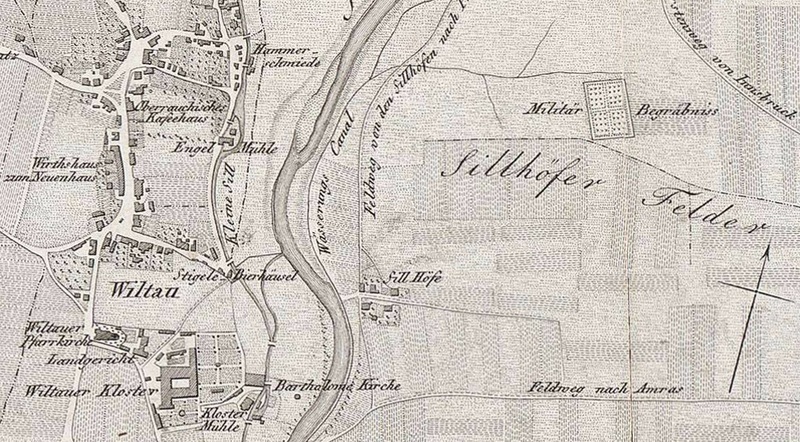 Wiltau is now called Wilten and is an area of Innsbruck (see map). She was bur in the military cemetery near Wilten, Innsbruck. 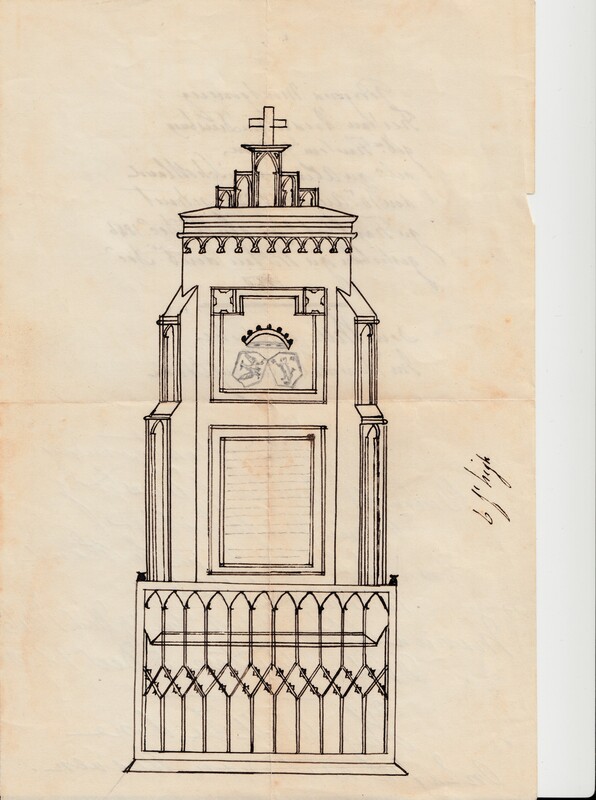 Large burial monument. Name recorded on grave at Nigg Bay, Aberdeen, but she is not bur there. expenses book of Arthur Augustus Gibbon lists "Toys for Anna de Roeder" on 19th Apr 1880.
died 11th Jan 1859, age 9 yrs. bur with mother at military cemetery, Innsbruck. Expenses book of Arthur Augustus Gibbon lists "wedding present to Julia von Roeder" on 27th Sept 1884. Phillipp de Roeder. Must be c.1870s. Image courtesy of Mike Hilligan. 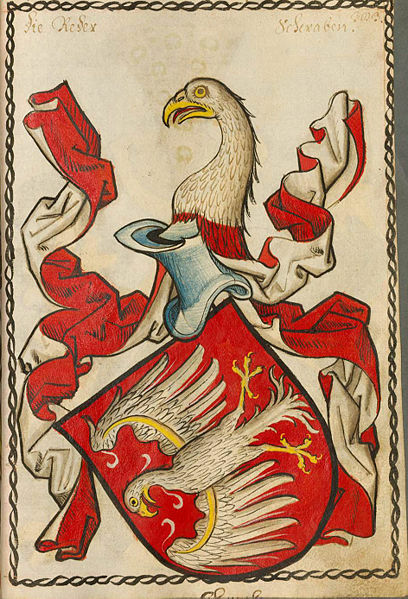 Arms of Roeder of Diersburg. See full size. From here. Georgina Gibbon (Baroness de Roeder) was bur in 1850 in the "Militärfriedhof" (military cemetery) near Wilten (Wiltau), Innsbruck, Austria. "Grabmal Röder von Diersburg" ("Tomb of Röder of Diersburg") in collection of Landesarchiv Baden-Wurttemberg J-N R 3. This is photo of Georgina's grave. 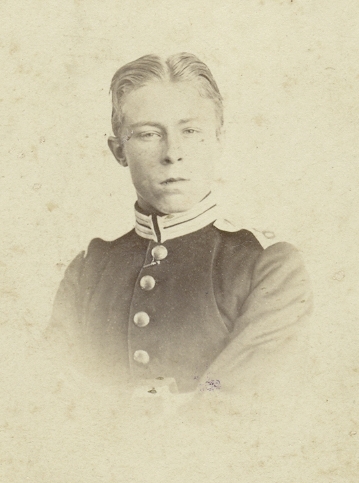 Photo possibly dates from 1851. 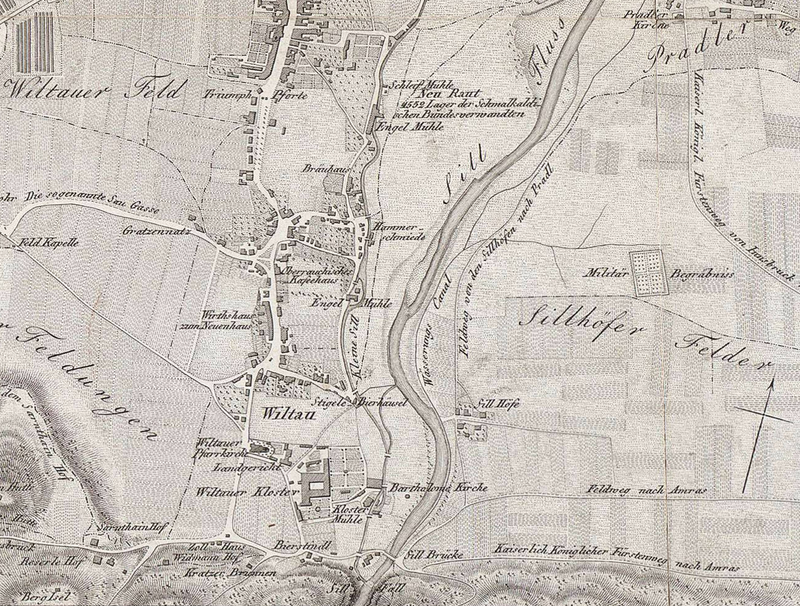 19th century map of "Wiltau" (Wilten) showing location of "Militar Begrabniss" ("Military Funerals"). 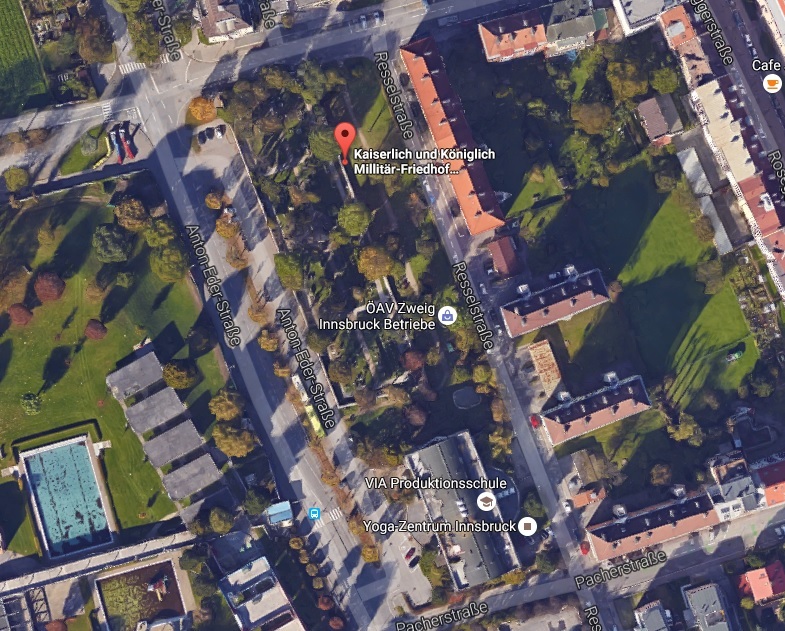 This must be the "Militärfriedhof" (military cemetery) where Georgina is buried. This is between Wilten and Pradl. This is now called the K.u.k. Militärfriedhof Pradl (Pradl military cemetery for the Austro-Hungarian Army). Modern satellite view of K.u.k. Militärfriedhof Pradl (Pradl military cemetery). See larger and full size. 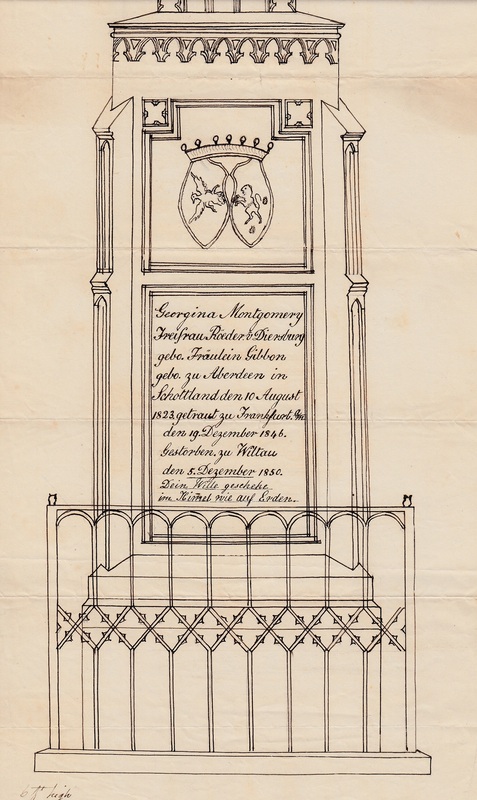 More detailed drawing of Georgina's grave. 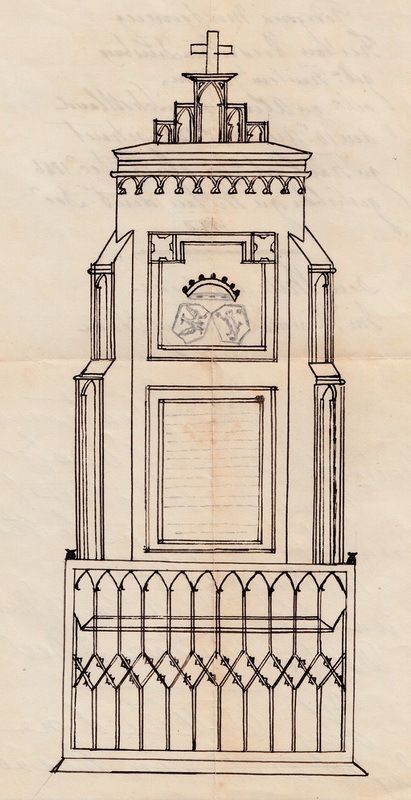 Note de Roeder arms on left, Gibbon arms on right. Two cups survive in the Gibbon family. 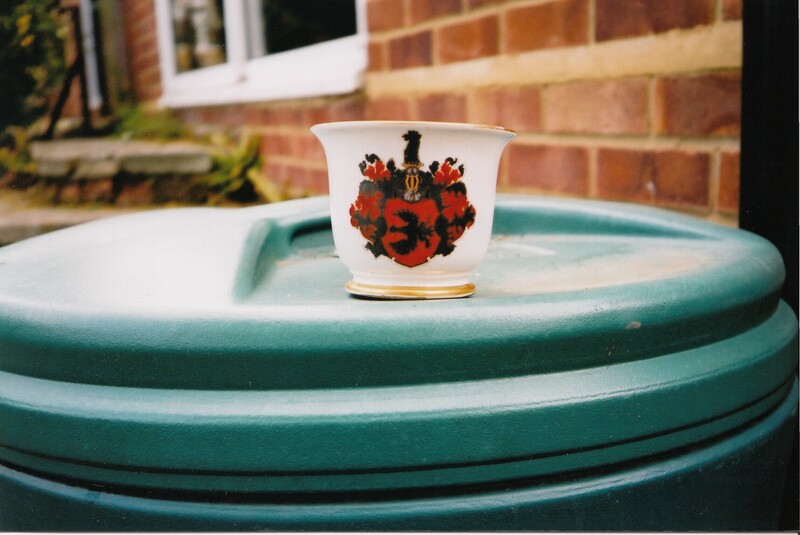 One cup has the Gibbon arms. 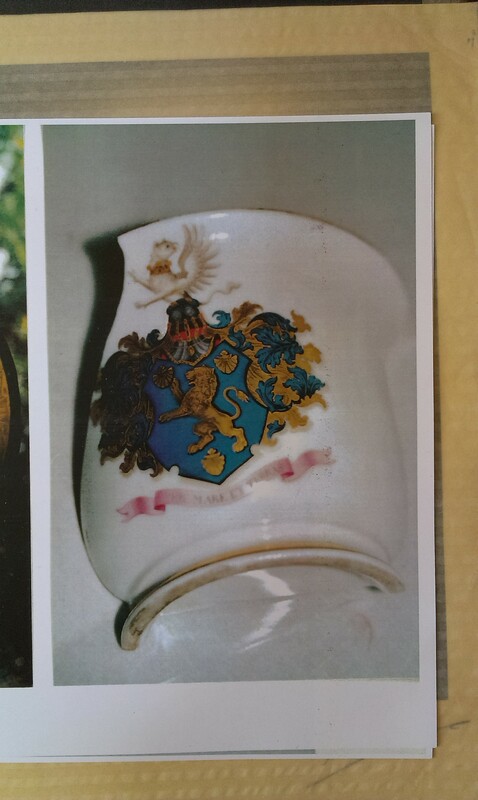 The other cup has the de Roeder arms. These two cups must date from the time of the Gibbon - de Roeder marriage in 1846. 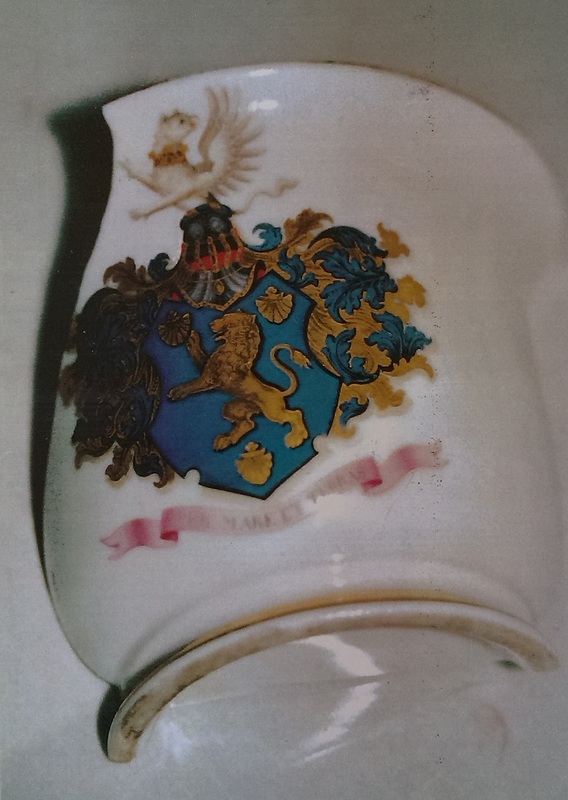 The cup with the de Roeder arms. 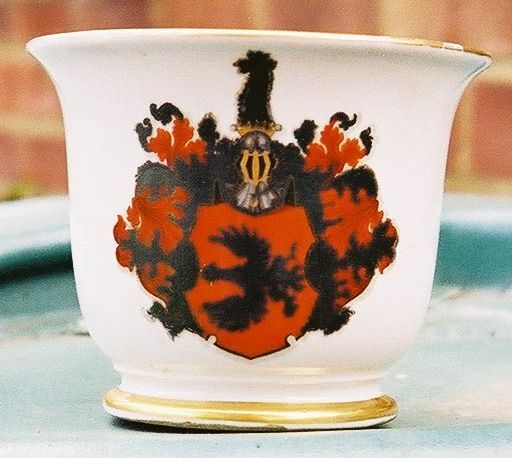 The cup with the Gibbon arms.